The comment has been made before that Lean is great for manufacturing, but not relevant for what design professionals do. Lean has great applicability to manufacturing as those processes are more static and there is significant repetition. Squeezing a few minutes or seconds out of a process that repeats thousands of times creates a savings that can be quantified. The design and documentation of buildings is indeed different but Lean and other process management approaches are still applicable. Buildings are comprised of many types of building systems such as interior partitions, HVAC systems, doors, cabinets, interior finishes, etc., - and the efforts of drawing, modeling and documenting them typically require similar if not identical, repetitive steps. There is value in developing easy to learn and use processes for dealing with the large amounts of repetitious information found on projects. ALL CABINETRY IS PLASTIC LAMINATE CLAD, U.N.O. or ALL PARTITIONS ARE TYPE K3, U.N.O. In both cases here the very act of modeling or drawing these components is scheduling the work and may not require any annotation; rather, our work is to identify and document those elements - i.e., the cabinets and partitions that do not meet the rules we just set. Scheduling Systems - another approach utilizing repeating elements or groupings of elements which are then referenced in an easy to see and understand manner. The Toilet Types system outlined below falls into this category. Visual QC - it is advantageous to look through a set of drawings and have the mistakes reveal themselves by virtue of how the drawing elements are shown in context with other elements. An important corollary is how the lack of information on a drawing or a model can be a purposeful clue and means to indicate there are decision(s) yet to be made or needed information is lacking. Every building has restrooms comprised of plumbing fixtures and toilet accessories (yes, this is truly exciting stuff). In addition to meeting clearance requirements for accessibility the components must be usefully arranged, scheduled and dimensionally located. A good example of how restrooms are documented by many firms. Create enlarged toilet plans for each restroom. Dimension overall restroom and tag partitions as needed. Create interior elevation of the walls with fixtures or cabinetry. QA: how do we know that accessibility clearances are correctly documented? Check each instance to verify with ADA, ANSI or other applicable references. More often than not, the needed information to bid and do the work is scattered throughout a drawing set requiring a contractor to reference multiple sheets in order to piece together the relevant work. 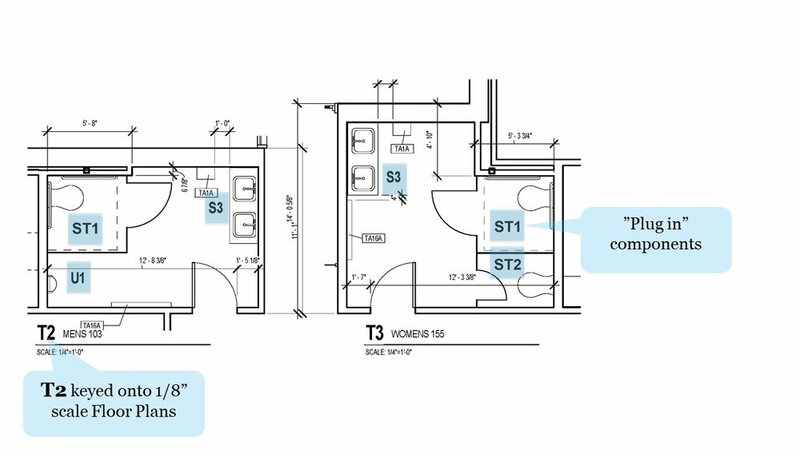 It is common to see fixtures and accessories tagged and dimensioned on both enlarged plans and interior elevations. This duplication of information takes time to annotate, must be reviewed and creates an opportunity for errors. With regards to recreating drawings that indicate ADA / ANSI requirements, use caution as these generally give ranges for heights and clearances. Your project's restroom layout and design may need the contractor to install items at specific heights or locations to coordinate with Architectural features such as wall tile designs or layout constraints. For example, the 2010 ADA Standards states that horizontal grab bars are to be mounted with the top of the gripping surface between 33 and 36 inches above the finished floor. That 3 inch range allowed may be more than your design can accommodate and not conflict with the top of a tile wainscot. Create enlarged toilet plans for each type or instance of a restroom layout. If needed, provide interior elevations for cabinetry or to indicate complex wall tile patterns. Toilet fixture and accessories are pre-elevated already. Accessibility clearances are correctly documented as the drawings reference pre-checked toilet fixture vignette drawings. "One stop shopping" - enlarged plans, fixture and accessory mounting height criteria, vignette toilet fixture layouts, sinks, showers, etc., w/ accessories and schedules. All of this is located together on one sheet to facilitate ease of use and checking. Just like in CAD, poor work practices in BIM will lead to errors. The benefits afforded by modeling should not be confused with the need to clearly understand the work that is being designed and the requisite thinking. Accuracy in modeling does not mean that building elements are necessarily constructible or that layouts are well thought out. Many firms are seeing BIM drawing sets swell in size. Looking more closely, this is not due to increased building complexity but instead the ease with which users can create views and populate drawings onto sheets. My July blog post noted that many believe that merely cutting a section or detail from the model to view and study the building automatically earns it a right to be on the CD set. It has been said that a picture is worth a thousand words. And while written text will continue to serve an important role in the architects documents, graphics best convey the visual organization of elements and the relationships between them. It is a worthwhile effort to employ graphics with scheduling techniques to simplify how you produce and present your work. It will bring value to your office and to the users of your documents. Next post I'll share additional details of the Toilet Types sheet system.